A leader driven by principles of dharma (righteousness) is elevated to the platform of spiritual leadership that enables one to be a visionary. King Yudhisthira, an emperor of the Vedic era, was such an exemplary leader. A saintly king, he was the renowned Ajatashatru (one who has no enemies), and in his kingdom reigned real peace and prosperity. Due to his flawless character, his subjects loved him. His true prowess was his unflinching adherence to satya(truth) and dharma, which were more precious to him than royal ambitions and material pursuits. Excellence in leadership is about creating an environment of trust and credibility as was exemplified in the character of King Yudhishtira. Such excellence in leadership can be built on the firm foundation of the 4 pillars of dharma, i.e. Truthfulness, Mercifulness, Cleanliness, and Austerity. Truthfulness is the basic principle of trust based relationships. Relationships are the basis to happiness, either in a corporate environment or in a family. Resorting to untruth or modified-truth to suit our requirement is very easy, but in the process we become less trustworthy—unknown to us. To practice truthfulness may require a conscious and concerted effort. However, once you have practiced and found merit in it, it becomes a way of life. Mercifulness forms the foundation of a non-violent approach to business. In today’s world, violence is everywhere—in speech, in action and in peoples’ minds. We criticize people unrestrictedly and we find it increasingly difficult to see positive aspects in others. However, if we want to become enabling leaders, we have to become positive motivators. In this connection, Radhanath Swami says that when we seek the essence in every interaction, i.e. when we look for the positive in every person, we develop a natural compassion for others and we are in a position to understand and help others in a positive manner. Such non-violence of speech, action and mind has a great influence on elevating our consciousness to a higher dimension wherein our vision becomes clear. And when we are seen as a genuinely compassionate leader, greater is our influence! Cleanliness in dealings defines business morality. When we are seen as a business house with great moral standards, we evoke high respect and response. To get there, we must begin by striving to purify our consciousness (internal cleanliness). The easiest way is by adapting a lifestyle that promotes a pure conscience. According to all the major scriptures of the world, chanting the holy names of the Lord and study of the scriptures are the two recommended processes to purify and elevate our consciousness. With a little practice, it becomes a way of life and when we conduct our business with the highest ethical and moral standards, the Lord grants us peace of mind as well. Austerity of speech, action and thought form the best source of connectedness with higher energy fields. Through them we are propelled to strive for higher goals, as opposed to striving for power, money, prestige, position, control, etc. Austerity means to use speech, action and thought as a means of service for the good of others and limiting its use otherwise. Overall, moment to moment conscious living. Great leaders are not born, they are made! The character of a person is much like a fine sculpture of marble or stone. The rough and unnecessary sharp edges from the raw material need to be removed. The process involves time, a hammer, and a chisel. Piece by piece the sharp edges are smoothened. If the stone or marble could ‘feel’, it would not be a pleasant feeling to have parts of it removed so harshly. Similarly, building ones character is a struggle, but if we persevere with the end goal in mind, we will be blessed with unimaginable fortune—the mettle which great leaders are made of will be ours too! About the Author: Preethi Pandit is an MBA by qualification and in her career of 10 years, she has represented corporates as head of HR and manager of large MNCs. She is a certified behavioral trainer and a coach as well. She quit the rat-race 5 years ago and ever since has actively taken up her flair for editing & writing as a full-time activity. More from this author. Thank you so much Maharaj! Auterity of speech is one of the key qualities I have seen Radhanath Swami practising. Radhanath Swami always speaks lovingly about the pastimes of Krishna. Radhanath Swami has this intense love for preaching. Wonderful article.Thank you very much for sharing nice article. Radhanath Swami exemplifies all the above four qualities and is an ideal leader. He is the most compassionate individual and as a leader positively encourages his followers to follow the path of self realization. Great leaders are not born, they are made! The character of a person is much like a fine sculpture of marble or stone. This statement really gives me inspiration as everything is still in my hands. A very beautiful read. Thank you for sharing. Especially liked the explanation in detail about the four pillars of dharma or righteousness. Nice article. Thanks for sharing it. I appreciate the way you have connected the principles of dharma to leadership. The society is badly lacking such leaders! moment to moment conscious living is something we all should strive for, I really apreciate the definition of good character vs talent. Our scripture are real gems showing us the path to cultivate good characater rather than showing off or aspirt for talents .. Thanks very much for the nice post Mataji.. Very practical solution is given herein by author.Though the indian culture is a vedic culture,we are loosing it at very high speed.This also become true from individual level to masses,that is at corporate level.I see all modified truth in my corporation.But authors endavour herein to make the things right is workable if individual is ready to accept the ultimate truth under constant bonafied guidence.And by this if individual develops his/her leadership qualities as written in this article,which is not in conflict with each other,but focoused on Supreme goal,yes peace of mind is assured,else simply rat race for false prestige and possition which will be taken away in due course of time.Thank you very much. this is so relevant in today's world. exactly what is needed to avoid the losses etc arising from GREED like the recent UBS USD 2bn fraud deals. If everyone follows this, corporate governance standards will improve drastically. We as Indians should expecially take care of this and learn from our scriptures. This article reminds me of a maxim,"What you have is God's gift to you and then what you become is your gift to God." Liked the analogy of marble that could "Feel" -for building character. Truthfulness is the basic principle of trust based relationships. it really true. Just like a diamond is made from rigorous process, a great leader is also made from these principles…Thank you for the wonderful expansion of the principles to another dimensional point of view. Wonderful article. Thanks for sharing it. A very beautifully crafted write-up. If all modern day people seated in the positions of leader are to follow the charter of leadership, shouldn't it be easy to see a better and livable world. Whatever explained avove is correct. Thank You Maharaj for teaching us good values. In a simple and logical way the author has linked the pillars of dharma to success in business. building ones character is a struggle, but if we persevere with the end goal in mind, we will be blessed with unimaginable fortune—the mettle which great leaders are made of will be ours too! wow, such an inspiring statement. Thanks for this good article! nice article.. thanks for sharing..
A very beautiful read. Wonderful and deep explanations on the 4 pillars of dharma, righteousness – that they are the foundation for excellent leadership. Thank you very much for sharing. Nice article considering all the aspects. “Good character is more to be praised than outstanding talent. Most talents are to some extent a gift. Good character, by contrast, is not given to us. We have to build it piece by piece—by thought, choice, courage and determination.” This is a very nicely said. We all strive to have a good character. Radhanath Swami is the best example for good character. Radhanath Swami so nicely explains the concept of Truthfulness, Mercifulness, Cleanliness and Austerity. thanx for sharing wonderful thought on character building. This is a wonderful article, thank you for sharing such wisdom. All these principles of truthfulness, cleanliness, mercy and austerity must be available in any leader. HH Radhanath Swami is one of those rare leaders in whom we find all the above principles in plethora. Nice message. Radhanath Swami shows all the qualities by his own example. Thakns for sharing it. This is one of the finest articles I have ever read.. Thank you for posting this beautiful article. Nice one. Shreemad Bhagavad Geeta talks about austerities in different modes. Thanks for sharing such a nice Article!!! Beautiful article. 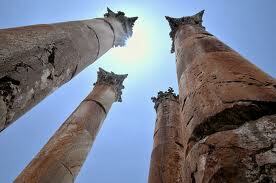 Thanks for gifting us the four pillars – Truthfulness, Mercifulness, Cleanliness, and Austerity. We are so fortunate to have received the instructions of HH Radhanath Maharaj to strengthen our character with the help of these four pillars. All glories to Guru Maharaj and our parampara !! Very wonderful website, very wonderful lessons to learn "Truthfulness is the basic principle of trust based relationships"
Wonderful article and beautiful explanation of four pillars. Radanath Swami has all these good qualities, that's how he has inspired so many sincere souls to dedicate their lives to be compassionate to others. Wonderful, wonderful thoughts. I really appreciate this article on how important (and tough) it is to build good character. Thank you for sharing this. Radhanath Swami teaches things by his own examples. As explained by Maharaji ji CAMT are are four very strong pillars/foundations of leadership. Leaders are always leaders in all the situations. Many thanks for this wonderful blog. Many thanks to radhanath swami for his wonderful teachings. This is a beautiful article. thank you very much for the nice article. building character takes time, effort and determination. Thanks for sharing. H.H.Radhanath Swami maharaj ki jai! How Vedic literature presents to us numerous lessons of leaderships through persoanilities like Maharaj Yudhistar, is just simply amazing, an we need not go any further to explore the science of leadership through any other narratives. The many wonderful examples given in this article really adds flavour to it all! Why cannot our present leaders of the society follow this principle. The world would be much better place to live in. Thank you Radhanth Swami for the deep insights. Mahatma Ghandi – “Be the change you wish to see in the world”. How to stop the mind from wandering? © 2019 Radhanath Swami | Leadership and Spirituality. All rights reserved.